Epicenter of the earthquake is only 40 km from the town of Salina Cruz in the province of Oaxaca. De pending on the data source the hypocenter of this earthquake is located in between 10 km and 58 km (a big difference). Salina Cruz has a population of 73,468 (latest census). San Mateo de Mar, even a little closer to the epicenter, has a population of 5,441. Both populated centers lie in the immediate vicinity of the subduction zone where the Cocos plate is diving under the Caribbean plate, thus creating a dangerous earthquake zone. This area has regular earthquakes and people are used to shocks from time to time. Earthquake-Report.com predicts no damage or injuries from this earthquake, although every earthquake can be felt differently. This earthquake is hardly reported by the Mexican press. All the spots are still on the aftermath of tropical storm “Karl” who is claiming at least 18 victims. 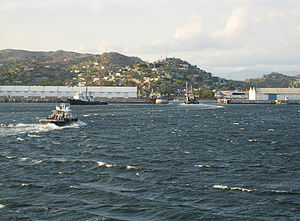 Salina Cruz is a major seaport on the Pacific coast of the Mexican state of Oaxaca. It is the state’s third-largest city and is municipal seat of the municipality of the same name. It is part of the Tehuantepec District in the west of the Istmo Region. The city had a 2005 census population of 71,314 persons, while its municipality, with an area of 113.55 km² (43.84 sq mi) had a population of 76,219, the state’s fourth-largest municipality in population. The port expanded in the late 19th century due to its location at the southern terminus of the Tehuantepec National Railway, which carried freight across the Isthmus of Tehuantepec. It is situated near the mouth of the Río Tehuantepec, on the open coast of the Isthmus of Tehuantepec, and has no natural harbour. There was only a small Native American village before Salina Cruz was chosen as the Pacific terminus of the railway, whereupon a modern town was laid out and built on adjacent higher ground. Epicenter in (the Mediterranean Sea) between the Greek island of Crete and the islands of Kassos and Karpathos. Almost exactly the same spot than the devastating earthquake and tsunami from 1303 (although there was not a good knowledge on earthquakes in that era). Today’s earthquake brings memories back to life and revives the possible dangers for mega-earthquakes in this part of Europe. Ask 1000 tourist who are leaving for Greece for a summer vacation what they should do in case of an earthquake ? If 1% knows the answer, it will be a great result. Based on history and present, it is a shame that tourists are not informed on how to behave in case of an earthquake. The 1303 Crete earthquake occurred at about dawn on 8 August. It had an estimated magnitude of about 8 and triggered a major tsunami that caused severe damage and loss of life on Crete and at Alexandria. The earthquake and the tsunami are recorded as having a devastating impact on Heraklion, Crete. Detailed information is available from reports made by representatives from Heraklion (then Candia) to the controlling Venetian administration, written on the day of the earthquake and twenty days later. They describe the extent of damage to the main public buildings of Candia and castles over the whole island. The reports also mention that most of the victims were women and children, without giving numbers. [ There was also massive flooding at Alexandria. Many ships were destroyed, some of them carried up to 2 miles (3.2 km) inland. The port city of Acre, on the Levantine coast, was also affected; buildings were destroyed and people swept to their deaths. 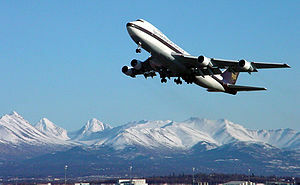 A moderate earthquake struck close to Anchorage, Alaska. The epicenter was under Fire Island and only 20 km from Alaska’s main city. Fire Island is unpopulated. Only a couple of miles from Ted Stevens International Airport..
Anchorage had a population of 276,263 during the last census. The quake was moderately shallow with a hypocenter at a depth of 42 km. Aftershocks continue to rattle the Chile February 27 main earthquake area. Epicenter today was in the coastal area about 40 km from San Antonio. The quake occurred at 1:46 AM. By experience we know that most Chile people do not wake up for aftershocks, although this one will be a limit case. Most aftershocks have a hypocenter in between 25 and 35 km, the same depth than the main earthquake of M 8.8 on February 27. As predicted before, aftershocks would occur continuously after the massive Darfield earthquake from September 4. 20 minutes ago another moderate M 4.6 aftershock has rattled the Christchurch area. A lot of ‘felt’ reports arrived quickly at the GNS Science. People living in the area reported overwhelmingly a MM (Modified Marcalli) value of IV = light to moderate shaking. As you will be able to see on the Seismograph, aftershocks can be very different even with the same Magnitude. 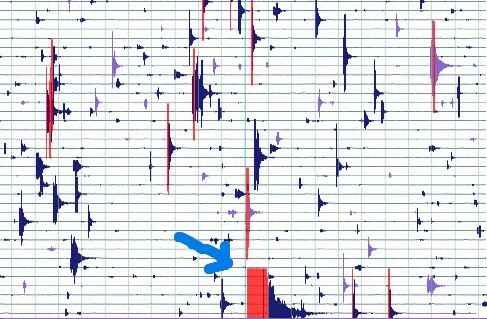 The 0:30 AM on September 20 looks terrifying on the seismograph, certainly if compared to other activity. Moderate but shallow earthquake under Umboi Volcano on Unboi island in Papua New Guinea. The nearest village in this otherwise almost entire wilderness area is Marli. As this is a small village, houses are mostly constructed with natural products like wood. Even if they collapse, they won’t create a lot of injuries. Umboi (also named Rooke or Siassi) is a volcanic island between the mainland of Papua New Guinea and the island of New Britain. It is separated from New Britain by Dampier Strait and has an elevation of 1,548 m. Umboi is a Holocene complex volcano with no historic eruptions. A complex volcano refers to the extensive assemblage of spatially, temporally, and genetically related major and minor volcanic centers with their associated lava and pyroclastic flows. The (preliminary) epicenter of the earthquake is located just outside Puntarenas, the cruise terminal city. The earthquake hypocenter was at a shallow depth of 25 km. The area is well known by tourists visiting the Reserva Biologica Guayabo in the Gulf of Nicoya. The Gulf of Nicoya (Spanish: Golfo de Nicoya) is an inlet of the Pacific Ocean. It separates the Nicoya Peninsula from the mainland of Costa Rica, and encompasses a marine and coastal landscape of wetlands, rocky islands and cliffs. 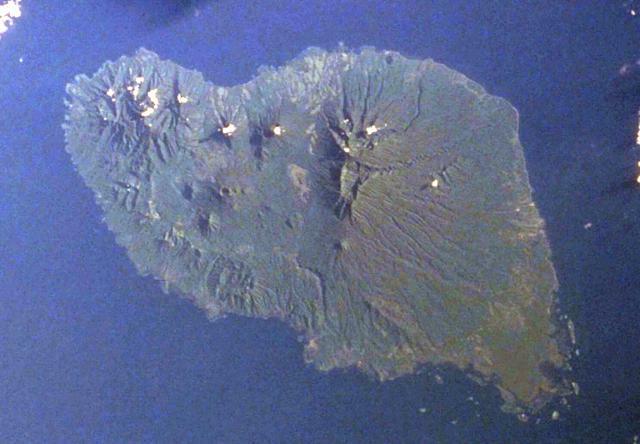 On the detailed satellite view it can be seen that the epicenter (if confirmed) is right under the beaches of Islas Negritos. Costa Rica is used to moderate earthquakes. National press in Costa Rica talks about a 5.3 magnitude (their source : Observatorio Vulcanológico y Sismológico de Costa Rica) and the depth calculated by the Costa Ricans is even more shallow at 15 km. The current epicenter area is active almost all year long. The quake originates from the Cocos plate who is subducting below the Costa Rica mainland. Within half an hour after the first shock, the authorities have at least registered 20 aftershocks.